After 16 Years, Afghanistan War Is 'At Best A Grinding Stalemate,' Journalist Says Pulitzer Prize-winning journalist Steve Coll warns that there is no end in sight to America's longest war: "Most of the generals ... say in public, 'There's no military solution to this war.'" 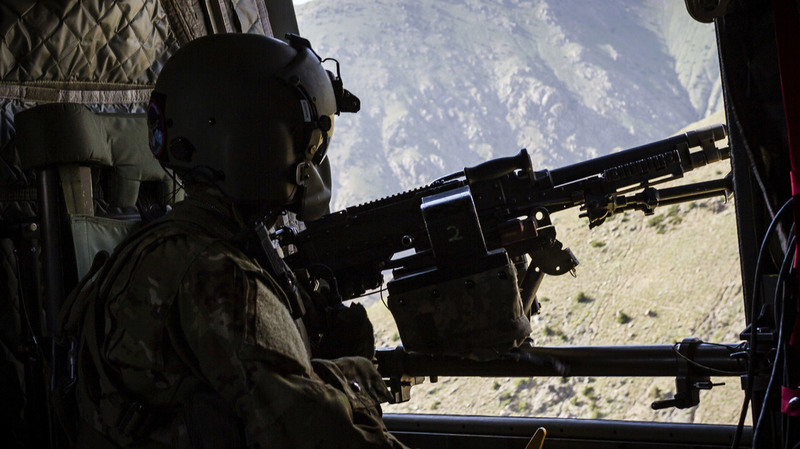 A U.S. Army helicopter crew chief scans the ground near Mazar-e-Sharif, Afghanistan in June 2017. America's war in Afghanistan is the longest war the U.S. has ever fought. Beginning a month after the terrorist attacks of Sept. 11, 2001, the initial mission was to remove the Taliban from power and destroy the al-Qaida terror network. Now, nearly 17 years later, Pulitzer Prize-winning journalist Steve Coll points out that the war's goals have changed. "The objective is not a grand peace ceremony on some grand aircraft carrier," Coll says. "It's to reduce the violence in Afghanistan, to reduce the suffering of innocents in Kabul, to support the constitutional government that we invested in after Sept. 11 so heavily in money and in American lives and sacrifices on the battlefield." 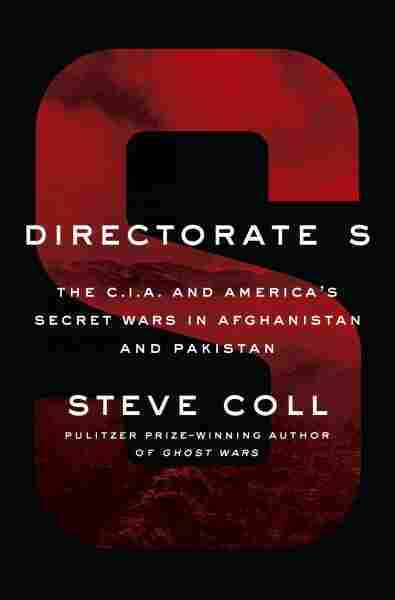 Coll's new book, Directorate S: The C.I.A. and America's Secret Wars in Afghanistan and Pakistan, is a follow-up to his Pulitzer Prize-winning Ghost Wars, which documented U.S. involvement in the region starting with the 1979 Soviet invasion of Afghanistan until Sept. 10, 2001. The new book — whose title is taken from the name of the Pakistani spy wing providing covert support to the Taliban — chronicles U.S. efforts in Afghanistan and Pakistan since Sept. 11, 2001. Coll warns that an end to the war is not in sight. So this starts around 2004, 2005, it really gets serious. ... Around that time, the Bush administration cut a really big agreement with India about its nuclear program. We basically forgave India for having a nuclear weapons program and offered significant nuclear assistance. We told Pakistan at the same time, "You're not going to get that deal. You're too much of a rogue state. You sell weapons abroad without permission. Anyway, we don't trust you enough." And it was around that time that the high command in Pakistan really thought, "You know what? The Americans are not reliable. They're really going all-in with India, our archenemy. The Americans are saying they're going to leave Afghanistan. They're really concentrating on their war in Iraq. Let's get back to work finding a way to have influence in Afghanistan through the Taliban." And that's when the war really started to deteriorate, and we did not see it coming. So what you have now is a picture of Pakistani stability, relatively, and Afghan instability getting worse, and one of the ways that's happening is that al-Qaida, little elements of al-Qaida or international terrorist groups, the Islamic State, have migrated back to Afghanistan from Pakistan. So one of the effects of the Pakistani approach to the war has been they've more or less finally managed to kick out a lot of the people who came into their country after 2001 that they didn't want, because they're revolutionaries. This is why the United States is back at war in Afghanistan. It's why President Obama was not able to end the war as he had hoped to do at the end of 2014. It's because along the eastern frontier of Afghanistan, near the Pakistan border, there are groups either affiliated with the international ambitions of the Islamic State, or other international terrorist groups including al-Qaida. Sam Briger and Mooj Zadie produced and edited this interview for broadcast. Bridget Bentz and Molly Seavy-Nesper adapted it for the Web.